(1) S'rî S'uka said: 'Nâbhâga, the learned youngest son of Nabhaga [see 9.1: 11-12, not the uncle also called Nriga nor the Nâbhâga of Dishtha, see 9.2: 23] returning from a celibate life received [as his share of the kingdom, the care for] his father because his elder brothers [already] had divided the property [among themselves]. 'We allot you our father as your share.' [they answered]. [The black man said:] 'Let us concerning this matter head for the son of Manu, your father and ask him', and thus he inquired with his father as was proposed. Third revised edition, loaded November 24, 2012. S'rî S'uka said: 'Nâbhâga, the learned youngest son of Nabhaga [see 9.1: 11-12, not the uncle also called Nriga nor the Nâbhâga of Dishtha, see 9.2: 23] returning from a celibate life received [as his share of the kingdom, the care for] his father because his elder brothers [already] had divided the property [among themselves]. 'We allot you our father as yours' [they answered]. Doing what his father had told him they gave him the proceeds of the yajña before they returned to their heavenly places. [Lord S'iva said:] 'All that your father said is true and also is what you are saying the truth. Let me, the knower of the mantras, grant you the spiritual knowledge that is transcendental and eternal. Please take all the riches. I give you all that has been offered to me', and having spoken thus Rudra, the great lord and guardian of the dharma vanished. Anyone who in the morning and in the evening with great attention remembers this becomes a scholar: he will become a knower of the mantras and the supreme destination and thus be a self-realized soul. The king said: 'Oh lordship, I would like to hear about him, that king who was so intelligent that the most insurmountable power of a brahmin's measure could not affect him. S'rî S'uka said: 'Ambarîsha, the man of great fortune, after achieving an unlimited opulence on this earth consisting of the seven continents, meant that all that is so rarely obtained by many a ruler is as the riches one imagines in a dream: coming to one's senses it is all gone. It is the reason because of which a man falls in ignorance. Unto Vâsudeva, the Supreme Personality, unto the devotees as also unto the saints he had achieved the reverence and devotion in the transcendence of which one takes this entire universe for something as insignificant as a piece of stone. He was sure to fix his mind upon the lotus feet of Krishna, to use his words to describe the qualities of [the Lord of] Vaikunthha, to use his hands for matters as cleaning the Lord's temple and to engage his ears in listening to the transcendental talks about the Infallible One. He used his eyes to look at the deities, the temples and buildings of Mukunda, he used his body to be in touch with the bodies of the devotees, he used his nose to smell the fragrance of the tulsî leaves on the lotus flower formed by His feet and used his tongue to relish the food that is offered to Him. By using his legs to walk to the Lord's holy places, by using his head to bow down to the feet of Hrishîkes'a and by engaging his senses more in being a servant of Him than a servant of his lusty desires, he was alike the ones who seek their refuge in being attached to the Lord Glorified in the Scriptures [like Prahlâda e.g.]. Thus in his prescribed duties always being of sacrifice unto the Transcendence, the Original Enjoyer of the Sacrifice, the Supreme Lord Beyond the Senses, he exercised all the different forms of devotional service and ruled, under the guidance of His faithful scholars, this planet earth [see also 5.18: 12 and B.G. 5: 29]. With horse sacrifices executed by brahmins like Vasishthha, Asita and Gautama, he worshiped, in all places where the Sarasvatî river flowed through the desert countries, the Lord of Sacrifice, the Supreme Controller, with great opulence and all the prescribed paraphernalia and remuneration. During the sacrificial ceremonies before the deities, the finely dressed members of the assembly, the priests and the other functionaries could be recognized as the ever vigilant demigods. A heavenly existence as cherished by the demigods, was not a thing desired by his citizens who were accustomed to hearing and chanting the glories of Uttamas'loka, the Lord hailed in the Verses. Persons accustomed to having Mukunda in their hearts rarely desire the perfections of the great ones because such aspirations go at the cost of the happiness of being in one's constitutional position of rendering service [see siddhis]. He, the king who in bhakti-yoga being engaged in austerities, in his constitutional activities unto the Lord satisfied all sorts of desires, thus step by step gave it up to fix his mind upon temporal matters as having a home, a wife, children, friends and relatives, a good elephant, a nice chariot and fine horses and durable goods like having jewels, ornaments, a nice outfit and such and a never empty treasury. Aspiring to worship Krishna together with his equally qualified queen, the king observed the vow of dvâdas'î [fasting on certain lunar days] for a whole year. At the end of that vow he in the month Kârtika [Oct. - Nov.] for three nights observed a complete fast [with one meal during the day] whereupon he, after taking a bath in the Yamunâ, worshiped Lord Krishna in Madhuvana [a part of the Vrindâvana area]. He with all paraphernalia for doing puja, according to the rules bathed the deity and dressed it with nice clothing and ornaments, fragrant flower garlands and other means of service in his [mahâbhisheka] worship of the greatly fortunate Lord Kes'ava and the brahmins that he performed with a mind filled with divine love and devotion. After having donated to the brahmin sages, the scholars who had arrived at his place, sixty crores of nicely decorated, young and beautiful cows equiped with gold covered horns and silver plated hooves, full udders and with calves at their side, he firstly sumptuously fed them with the most heavenly, delicious food. When he to the full of their satisfaction and with their permission next ended his own fasting and was about to observe the concluding ceremony, they all of a sudden were confronted with an unexpected visit from the mighty sage Durvâsâ. Despite having appeared there uninvited, the king showed his respect by standing up and offering him a seat. Thereupon he asked him, with all regards having fallen at his feet, whether he would like to eat something. He gladly accepted that request and went, in order to perform the necessary rituals, to the Yamunâ to dip into the auspicious water and meditate on the Supreme Brahman. The great king thus drank water and awaited, with his mind turned to the Infallible One, the return of the brahmin mystic, oh best of the Kurus. After Durvâsâ had finished the rituals at the bank of the Yamunâ and returned, he was well received by the king, but he discovered by his insight what had taken place. Trembling with anger he with a tightened face frowning and also hungry, addressed the perpetrator who stood there with folded hands. 'Alas, this one here, this 'love of the people', has in his madness about his opulence, for everyone to see, violated the dharma! Not being a devotee of Vishnu at all, he thinks that he is the Lord Himself! Speaking thus he, red with anger, pulled a bunch of hair out of his head and created a demon for him resembling the fire at the end of time. As the demon came towards him with a trident blazing with fire in his hand and a footstep that made the earth tremble, the king, seeing him clearly, did not move an inch from the spot [compare 6.17: 28]. As it was arranged by the Original Person of the Supersoul for the protection of His devotees, the cakra [that Ambarîsha had received, see verse 28] burned like a fire that angry serpent of a created demon to ashes [see also B.G. 18: 66]. Seeing that his attempt had failed and that the disc was coming after him, Durvâsâ started to run in great fear wherever he could go in order to save his life. When the muni saw the disc, that chariot wheel of the Lord, closely behind his back, he like a snake pursued by the flames of a highly blazing forest fire, quickly ran to mount Meru to enter a cave there. But in whatever direction Durvâsâ fled - of the sky, the earth's surface, in caves, in seas or to all the worlds up to heaven -, he saw the unbearable Sudars'ana cakra ['His immediate fearful presence']. 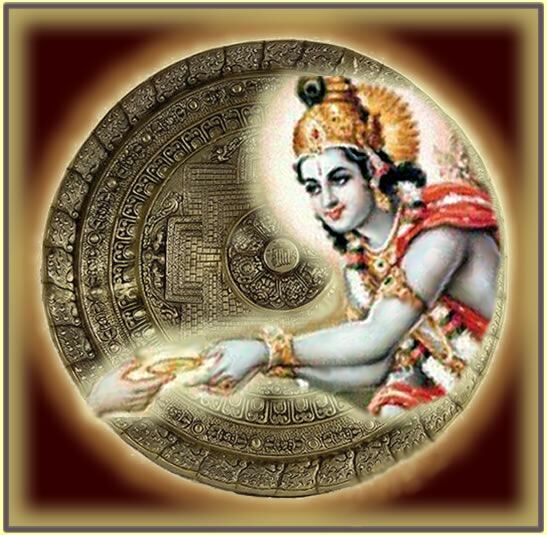 Durvâsâ who, scorched by Vishnu's cakra, was turned down by Lord Brahmâ, went for his shelter to him who always resides on Kailâsa [Lord S'iva]. S'rî S'ankara [S'iva] said: 'My dear one, we have no power over the Supreme One, the Transcendence in Person with whom I, the other living beings and even Lord Brahmâ wander around within the countless universes that together with us at times arise and are destroyed again. Durvâsâ thereafter went disappointed to the abode of the Supreme Lord known as Vaikunthha where He as S'rînivâsa, the Master of the Abode, lives together with the goddess of fortune. Scorched by the fire of the invincible weapon he fell down at His lotus feet trembling all over and said: 'Oh Infallible and Unlimited One, oh Desire of the Saintly Ones, oh Master, offer me, this great offender, protection, oh Well-wisher of the Entire Universe! The Supreme Lord said: 'Precisely, oh brahmin, I am not self-willed, I am fully committed to My bhaktas. My heart is controlled by devotees free from material desires. Even a devotee of My devotee is dear to Me. I, their ultimate destination, take without My saintly devotees no interest in the blissful essence or the elevation of My opulences [see om pûrnam]. How could I give up on those who taking shelter with Me gave up their wife, house, children, relatives, their lives, wealth and promotion to a superior position? The way a chaste woman is of service to a gentle husband, I act as a servant to pure and equal minded pious souls [see also 7.9: 43] who in their hearts firmly being attached to Me engage in devotional service. Devoted to Me they do not hanker for the completeness [the pûrnam] of the four types of liberation they automatically achieve by simply being of service. Why would they care about other matters that are all lost over time? Pure devotees are always in My heart and I am always in their hearts. They know nothing outside of Me and I do not have the least interest outside of them [see also B.G. 9: 29]. Let Me now tell you how you can protect yourself in this matter. Oh scholar, listen attentively to what I have to tell you. With this action of yours you have violated yourself. Waste no time any longer and go forthwith to him [Ambarîsha] because of whom all this took place. As you can see, the power applied against a devotee turns against the one doing so. Penance and knowledge bring the learned ones the greatest welfare, but practiced by an obstinate person they result in the opposite. a work of art from Exoticindia.com. Used with permission.